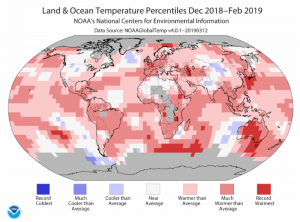 NOAA’s latest monthly climate summary for the globe was released earlier this week. It shows that for the earth as a whole, this was the 5th warmest on record since 1880. Note that parts of North America was one of the few areas globally that had a significant cold departure, although that was not true in the Southeast US. For the winter months of December 2018 through February 2019, this was the 4th warmest winter on record. 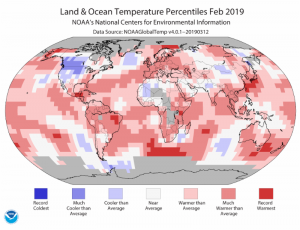 You can see more maps and read more about it at https://www.noaa.gov/news/february-2019-ranked-fifth-hottest-on-record-for-globe and read the report at https://www.ncdc.noaa.gov/sotc/global/201902.